Weeks ago, I put an old 55 gallon plastic drum under the rain spout. I did not have time to make a proper rain barrel out of it. Of course, it rained and the drum is now full and heavy and nearly impossible to move. So how am I going to get the water out of it to use it on the flowers? Easy, I will pump the water out using an easy to make, hand-powered water pump. 3/4 inch PVC pipe. How much pipe depends on your needs. I need enough for at least one side of the pump to reach the bottom of a 55 gallon drum. Wood dowel rod. This rod has to fit inside the PVC pipe with some wiggle room. An old rubber sandal or any other source of rubber. Two check valves. This is the heart of the pump. You can buy these at most hardware stores for about $7 each. I think they are pricey but I looked into making my own and I thought it would save me time to just buy them. Maybe sometime in the future I will revisit making my own check valves. Optionally, you can get PVC primer and PVC cement to glue the whole thing together once you are happy with the arrangement. My pump is not glued so it falls apart after about 20 or so pump but it’s very easy to reassemble. Tools: a drill, a saw to cut the PVC pipe, and a knife or scissors to cut the rubber gasket for the piston (dowel rod). Making this pump takes as long as it takes you to cut small PVC pipe segments with a pipe saw and to cut the rubber gasket out of the old sandal. By far the most elaborate part of this project is cutting out the gasket out of an old sandal or any other source of rubber. I traced the circle using the end of the PVC pipe. Once I attached it to the dowel rod I found out it was too big to fit inside the pump handle so I trimmed it with scissors. You want it to go into the PVC handle nice and snug. The objective is to create a vacuum inside the PVC pipe handle. You notice I attached the rubber gasket to the dowel rod using a standard wood screw. I imagine this piston won’t last forever but I’m betting it will last to the end of the season. Meanwhile, I will keep an eye out for something more durable. 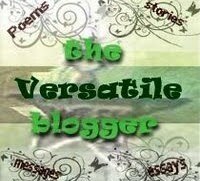 A word about the check valves. The go one way. They are marked with arrows telling you which direction the water will flow. Obviously, you need to align them to ensure the water comes in one end and out the other. 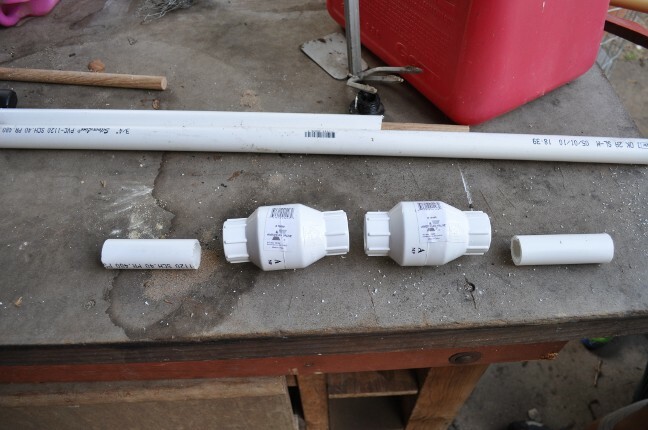 I attached long sections of PVC pipes to the open end of each valve but what I will do in near future is find an PVC fitting that will allow me to connect a water hose connector. I intend to run a hose to the garden and pump the water all the way directly from the barrel. What was it I said the other day…Oh yea, that you could make anything!!!! This is awesome. Very resourceful. Happy watering! I’m completely a beginner when it comes to building anything with my own two hands, so this may be a dumb question, but where does the dowel fit for me to pump? Does it fit into the middle section of the “T” or the top section? I understood all of the construction, but the very last part eluded me. This probably means its so simple that there was no need to explain, but when it comes to mechanical things, I can be pretty slow. The dowel goes in the ‘leg’ of the T. The ‘bar’ of the T will have the valves. You pump the dowel up and down the leg and it creates the suction. I found out by using this pump that it is definitely better to glue the parts together with pipe adhesive. The pump lasted a long time. 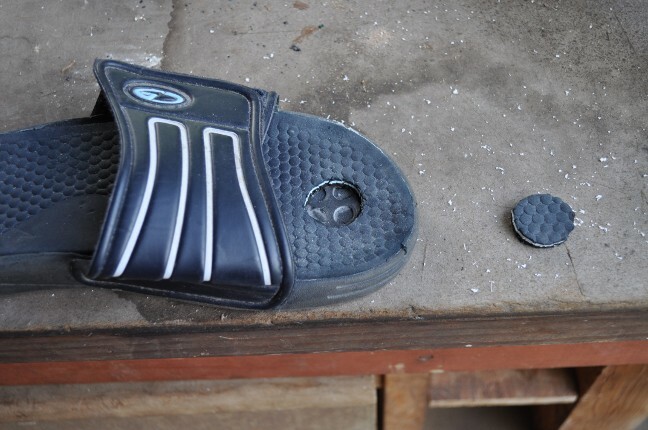 Eventually, the little rubber seal I made out of the old sandals got misshapen and the suction stopped. It was easy to make a new dowel. Hello there, I discovered your blog by way of Google at the same time as looking for a comparable matter, your web site came up, it appears to be like great. I’ve added to my favourites|added to my bookmarks. Needs a completed diagram…. very unclear. OK, so let me get this straight, the right side of the photo with the T is the intake side, the handle goes into the upright pipe and when pulled creates vacuum to draw water up the pipe and past the first one way valve when you push down on the dowel, you force the water past the second valve to the left and out to your garden or tank? Is that correct? Michael, yes, I think you have it right. I am sure with some tinkering, this pump can be improved. I understand the construction, does only one side of the T go into the water? Kassi, yes, only one side goes in the water. The side with the pump of course, does not go in. Have you determined the head-height/lift-height for this design (the vertical distance it will raise water from the source)? 1) Be sure to use “Schedule 40″ PVC pipe and fittings — not the cheaper (and much less durable) irrigation-grade Schedule 20. The difference in cost is negligible. 2) Be sure to use PVC primer/cleaner on all surfaces before you glue them to keep the joints from separating later. Glue by itself forms an inferior joint. Follow the directions on your primer/cleaner carefully, as some formulations call for applying glue while the primer is still wet; others require you to let the primer dry first. 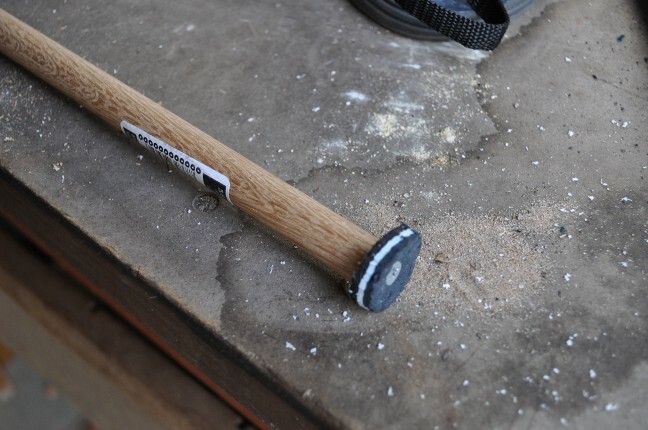 3) Place a 1/2” fender washer between the rubber disc and the head of the screw on the wooden-dowel piston. It will support the center of the rubber, producing a more consistent seal between the piston and the PVC pipe — and making the rubber less prone to tear out around the screw head. 4) Glue a “3/4 in. Slip x MHT PVC Fitting” (Part 685741 from the ‘Large Orange Home Center,’ or its female equivalent) to the input and output ends of the pump assembly. 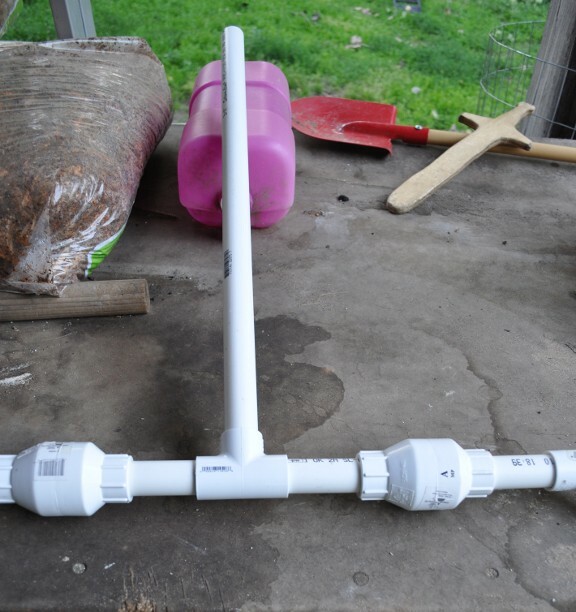 This makes it easy to connect regular garden hoses — especially useful in a SHTF scenario where you might need to drop a hose down your existing well casing to reach the water table. 5) Using scrap lumber and a couple of Conduit Clamps (either PVC or, for greater durability, steel), make a solid mount to hold the pump . Your pump will last longer if its mechanism — particularly the T that connects the upright tube to the two check-valves — is supported to minimize flexing of the T fixture on the in and out strokes. Flexing under stress is the death of PVC joints! 6) To improve suction, periodically lubricate the perimeter of the rubber piston with a light coating of petroleum jelly (vaseline) or silicone valve lubricant, available at your local hardware store. Arkie John it’s an engineering question not easily answered outside of lot of experimenting or in a lab with good grasp of fluid mechanics and math. #2 & #3 affects how close to a true vacuum it can make. #1 affects the air pressure which limits maximum height any pump can lift water. 2) how much force can be applied to the piston. 3) how strong the parts are. Regarding #3 on the input side, is a shorter or longer length better? What would be optimal? Dan think, air is compressible and the less you have to deal with the easier is it to make it do what you want. The smaller the chamber the less air there is the easier it is to make a high vacuum (intake stoke) and also less volume make it easier to get the pressure high enough to get it to move the air out of the chamber (exhaust stoke). This about making the pump work. Now if you need air in surge/pressure tank that is different story. Or you can buy this cheap one from Home Depot for about $3.00 . I use a siphon hose with a squeeze bulb to begin the process and let gravity do the rest. Not much pressure but it works. If you continue to squeeze the bulb it will come out much faster. Like what you have done, think it is great. The one thing that I think will improve it is the pipe that you use with the dowel I would use a coupling to increase that pipe to 1″ or bigger you will get more volume and have to pump less. I know it is much easier to improve a design that come up with the design in the first Place. Again I am impressed with what you have done. Tom just understand the larger the pump rod diameter harder it will be to pump, not that it won’t work just that there is more friction and larger area lower the pressure each pound of force gives to the water. So you need to experiment to find the ideal size for you. A tee with a threaded side hole or put threaded adapter on it to make it easy to change sizes. The photos are very unclear on how this thing goes together! I may have to try and find this out on my own; but about the check-valves, would they allow for a continuous gravity-fed flow? Im thinking about placing the pvc pump on the lower end, and simply using it to prime a siphon. What are your thoughts? Great idea and I think your directions are completely sufficient.